You’ve chosen the colors for your wedding. You’ve picked out your gown and the bridesmaids’ dresses. Now you’re ready to choose the flowers for your bouquets. • Contrasting colors that add a stylish flair to your color scheme. Following are some options for contrasting colors based on several of the most popular current wedding-color schemes: orange, green, purple, red and blue. To ensure that this bold color doesn’t become garish, combine it with deep chocolate browns, purples or red. Accent with yellow or green foliage or blossoms. Such striking contrasts are particularly appropriate for autumn nuptials. Blend jade or forest green with white, pale pink or silver. If your main color is a more eclectic lime green, opt for contrasting colors of fuchsia, orange and cherry with lemon accents. Peacock greens work well with scarlet, pumpkin and yellow. Gold is a popular hue to mix with this regal color. But if you prefer a more funky choice, mix it with magenta or tangerine. Green is the color opposite red on the color wheel. Unless you are getting married close to the holidays and want a Christmas-themed event, however, choose options such as blue, purple or lilac to contrast with your scarlet scheme. When choosing deep shades of azure, you can opt for safe, traditional choices of gold or silver as your contrasting color. For brighter hues of blue, such as turquoise, choose equally bright colors—such as crimson, orange and yellow—to add boldness. 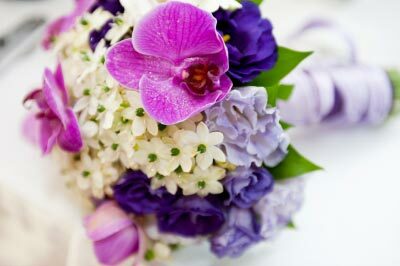 Check out this article for a list of flowers and their various available colours and meanings. Florists pay close attention to current color trends and can provide insightful tips on how to make your bridal bouquets and decorative arrangements alluring additions to your wedding’s overall style. So rely on their professional advice. But make sure you clearly communicate your personal flair as the two of you consider all of your options. PS: If you enjoyed this article, help spread the word by clicking the “Like”, “Tweet”, “+1” buttons or sharing it using the share icons below. Want to read more articles like this? Then Subscribe to our Updates, and get our articles directly to your inbox or RSS reader. Gina B. Kellogg is an editor and primary contributor at Florist Chronicles. Gina previously was editor of a U.S.-based magazine for florists. Today, she covers a variety of topics as a freelance writer and editor at her company, Hott Cornflakes Communications. See more of her work and contact her via www.hottcornflakes.com or follow her on Facebook, Twitter, LinkedIn or Google+. Gina B. Kellogg has written 15 articles for us. 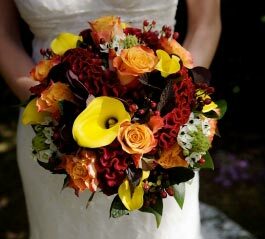 I never realised there was so much to consider when choosing your bridal bouquets. In my mind I always wanted my bouquet to consist of my favourite flower, Gerbera’s and just choose the colour to tone in with the colour scheme chosen. After reading your insightful article (as always); you have given me lots to consider. Thank you! Thank YOU, Michelle! And good choice in planning to use gerberas. They will make a beautiful bouquet. I almost chose them for my wedding bouquet!